In another demonstration of our streaming capabilities we decided to cover an important event live. The event was a candidate forum between 10 people running for the Democratic nomination for Virginia’s 8th congressional district. That seat is currently held by democrat Jim Moran who announced his retirement late last year. 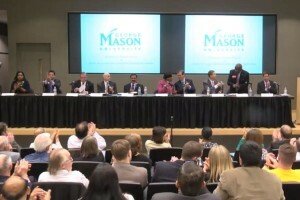 The forum was hosted by George Mason University’s School of Public Policy. Production resources were from Arlington Independent Media. Streaming functionality was provided by Kathi Overton of Doppler Shift Productions. The event was well received. Officials from GMU were delighted that they were able to get this level of exposure. The event can be seen here up to the June 10 primary election.